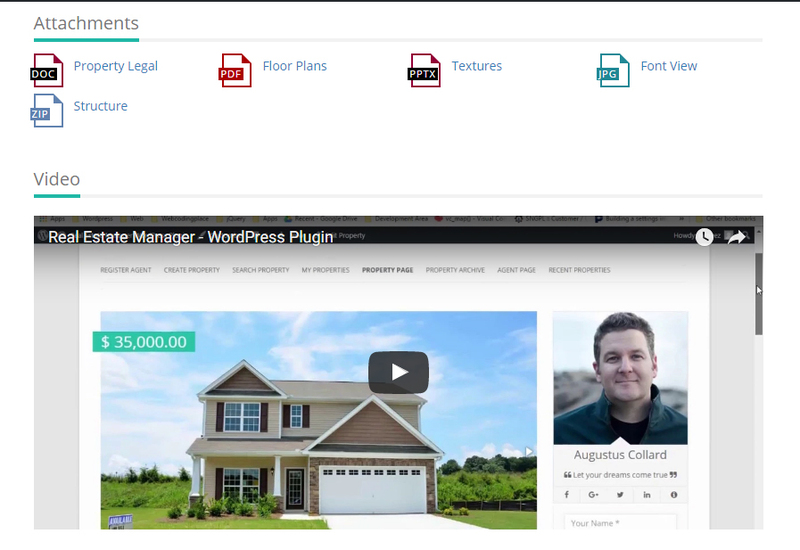 It is also a WordPress based Property Management System which allows you to own and maintain a real estate marketplace, approve registered agents, accept property submissions, agent profile management etc. Leaflet: Leaflet is also available to load map from OpenStreetMaps if you don’t want to use Google Maps. WooCommerce: Compatible with WooCommerce to manage paid subscriptions. Gutenberg: Support for Gutenberg editor is also added to easily insert property blocks. Visual Composer: 12+ Visual Composer elements are added to easily insert and manage shortcodes. Widgets Included: Search Widget and Mortgage Calculator Widgets are available to add to the widget areas. Google Captcha: Integrated captcha to secure registration and contact forms. - Many other fixes and enhancements. 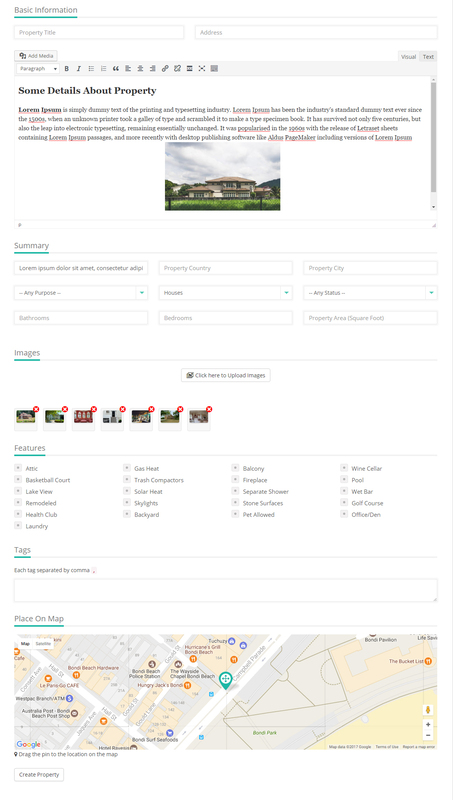 - Feature Added: Edit property option added to change featured image. - Many other fixes and special thanks to Crystal McNair for fixing a lot of Google Map related issues. - Feature Added: While searching, leaving min or max price fields blank will take minimum and maximum respectively. - Feature Added: Display properties based on Features attached, using shortcode attribute features. 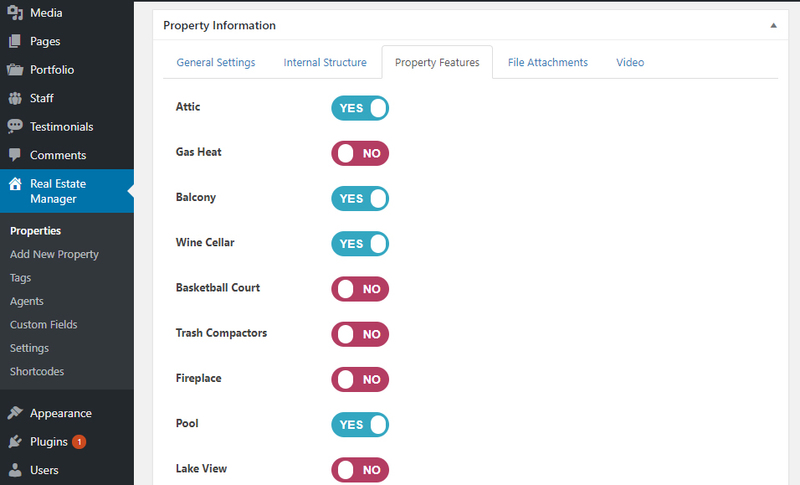 Eg: features="attic,balcony"
- Feature Added: Section classes added for single property page. - Bug Fixed: Fixed a major issue from previous release that deletes mandatory fields. - Feature Added: Gallery Slider controls including width/height and image fit. 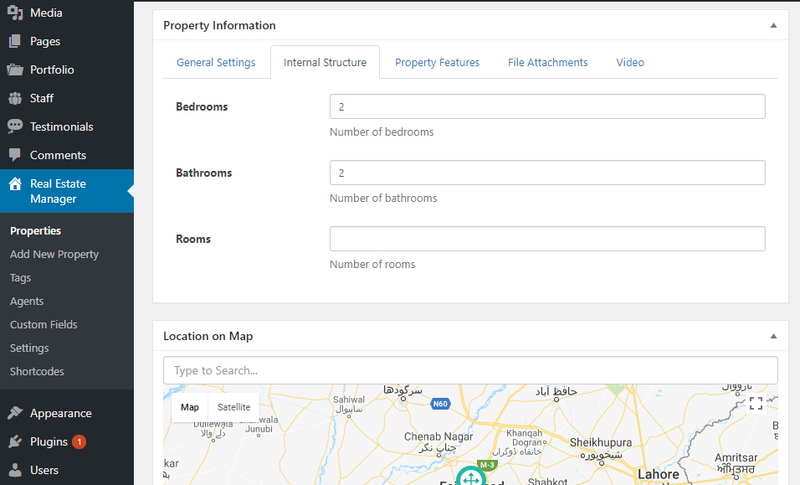 - Feature Added: Display logged in agent's properties in property listing, carousel and map. 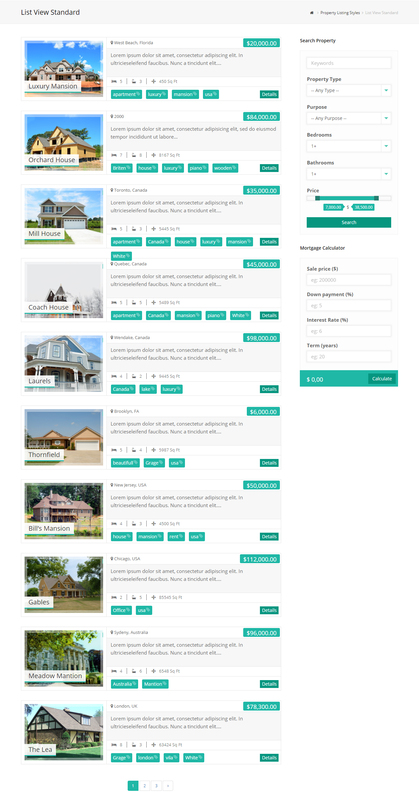 - Feature Added: Custom Email messages after property submission, and approval. - Feature Added: Languages Added Danish and Portuguese - Brasil. 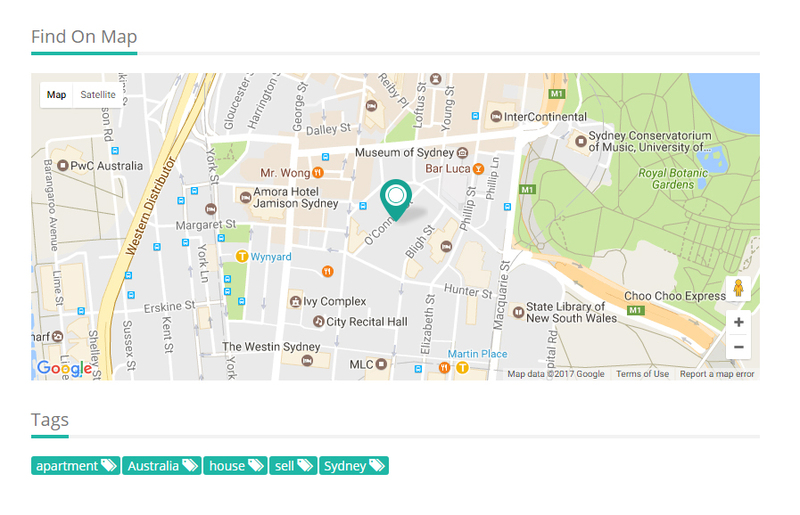 - Feature Added: Map support with drag icon when creating property from wp admin. - Feature Added: Full screen popup support for property gallery images. - Feature Added: UI Enhanced. - Feature Added: Pre translations added. 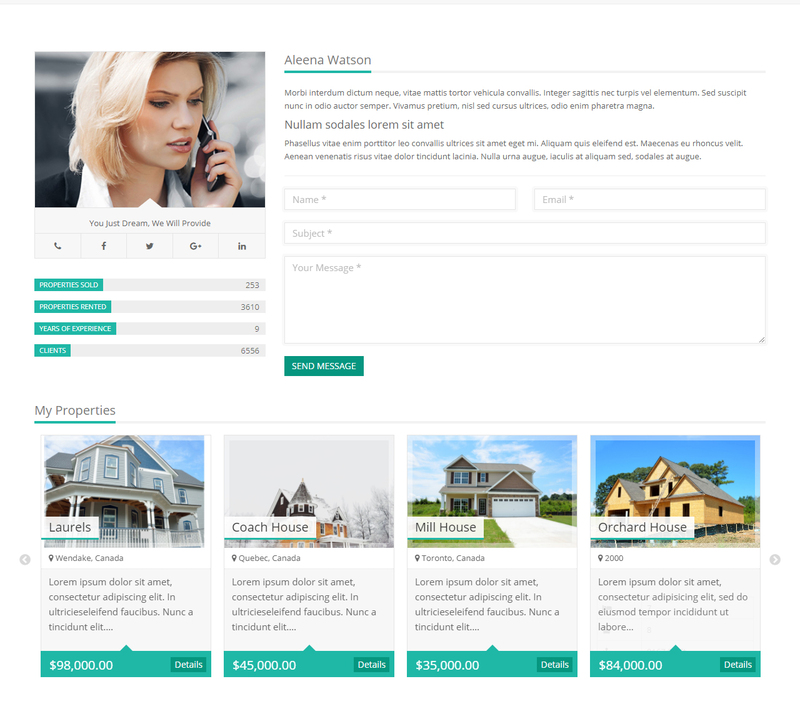 - Feature Added: Sale Price for Properties. - Feature Added: Updated POT file. 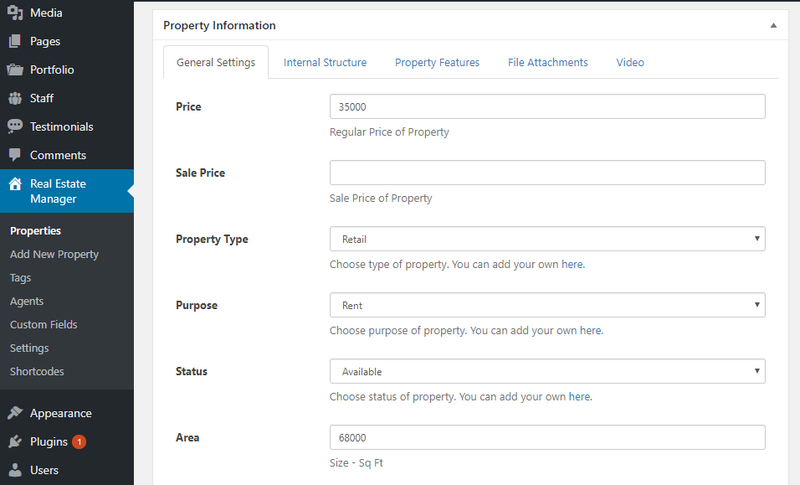 - Feature Added: Frontend property editing. - Feature Added: Logout button added on edit profile page. - Feature Added: Touch Slider added for better navigation on touch devices. - Feature Added: Enable/Disable Font Awesome or Bootstrap Script if you're theme already loads them. - Feature Added: Display Google Map by Address without providing latitudes and longitudes. - Bug Fixed: Search Results from widget, pagination breaks on next pages. - Bug Fixed: Conflict with some theme's menus is fixed. - Feature Added: AJAX Search fields can also be managed from drag drop interface. - Bug Fixed: Address is no longer a required field.